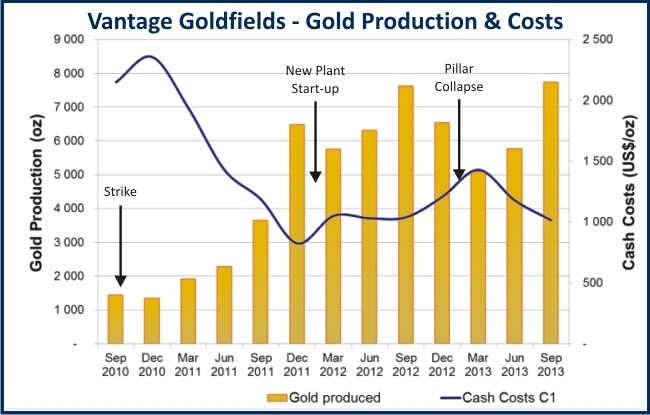 The Company’s exploration program is designed to provide a “pipe-line” of projects at various stages of investigation that will meet the Company’s strategic objective of increasing its gold production output to 90,000 ounces per annum, or more. Exploration activities have been concentrated on prospects considered to have the best short-term potential for economic development. 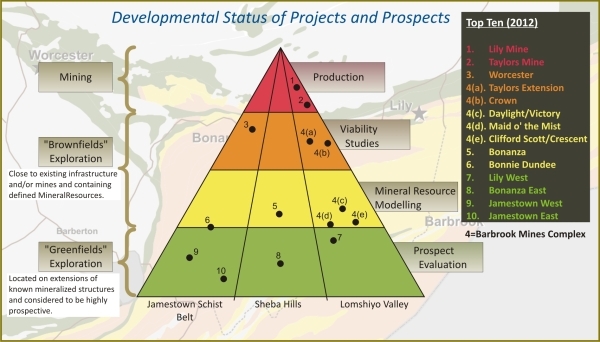 The Company’s strategy is to adopt an approach which focuses on the highest probabilities of discovery in the three main areas of activity, being (1) the Lomshiyo Valley containing the Lily Mine and Barbrook Mines Complex, (2) the Sheba Hills, containing the Bonanza Project and (3) the Jamestown Schist Belt containing the Worcester Project. 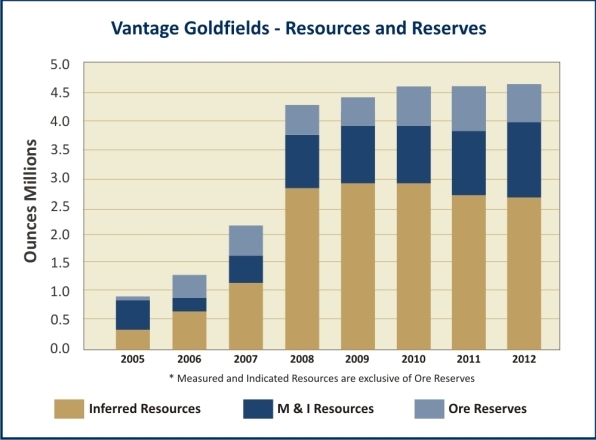 Priority is placed on “brownfields” projects which are sites of known gold mineralization close to existing infrastructure or current mining operations, and which already contain defined Mineral Resources. 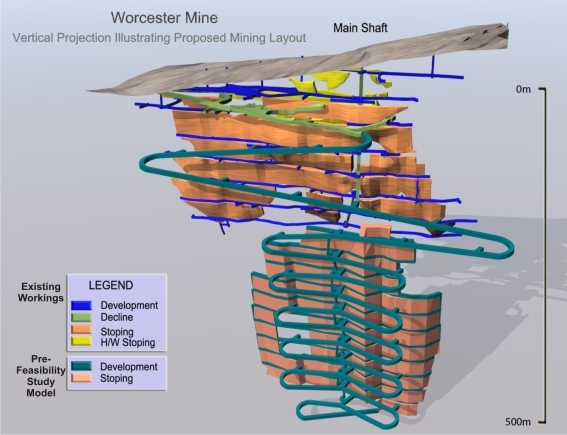 Regional exploration is also being conducted in highly prospective “greenfields” prospects located on extensions of known mineralized structures. Vantage has numerous projects and, for many of these, there are data bases of geological and sampling information derived from surface and/or underground excavations and surface and/or underground drilling. Re-evaluation of this information has led to the prioritization of projects warranting scoping and/or feasibility studies. 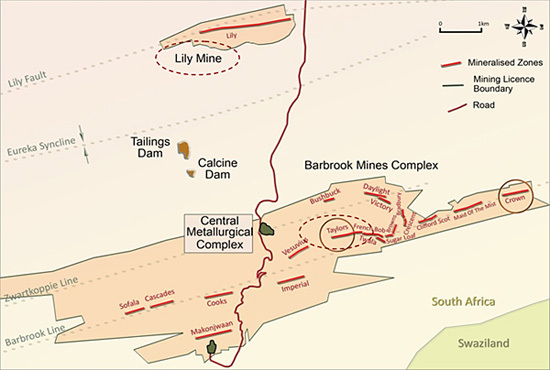 Most of the funds allocated to exploration since listing were spent on drilling at three of the Company’s targeted project sites, all located in close proximity to active or dormant mines (Lily, Barbrook and Worcester). 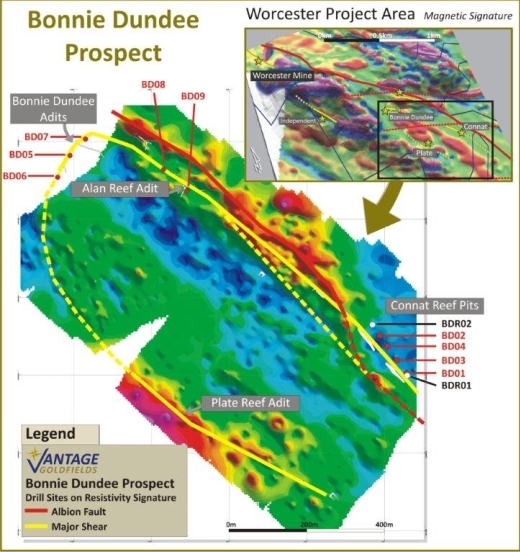 In addition, a high resolution, airborne magnetic and radiometric survey was completed over the bulk of the ground covered by Vantage’s Prospecting Rights. 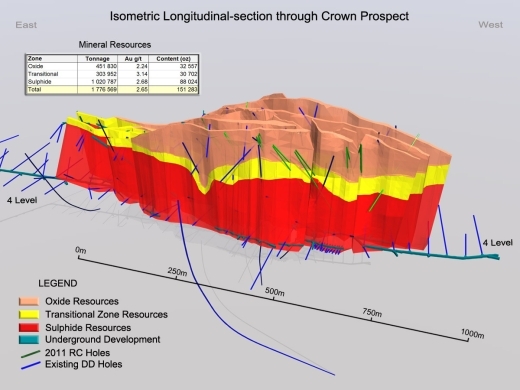 During 2012, consultants ASVI Technical Services Group (“ASVI”) were commissioned to analyse the large data base of regional exploration information (geological, geochemical and geophysical) within the context of the results of the airborne survey. 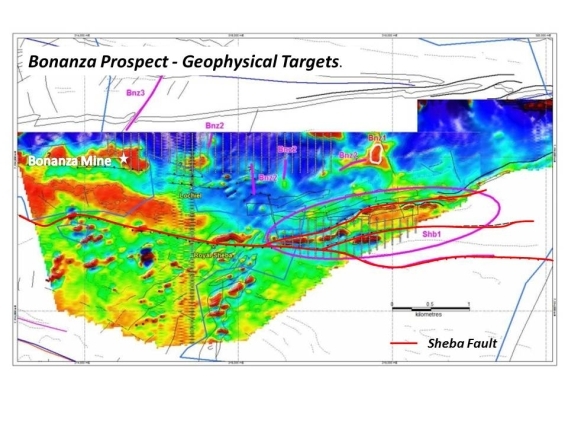 In addition to providing an improved structural geological map of the goldfield, ASVI’s report included details of a large number of prioritised targets for follow-up exploration. 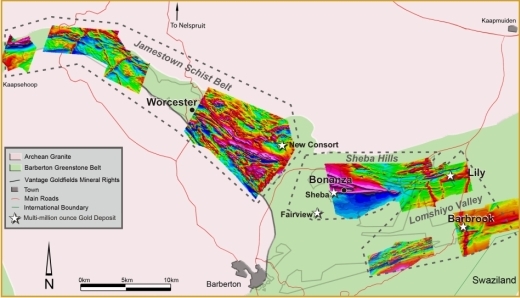 A field exploration program consisting of ground-based geophysical and geochemical surveys within the Company’s Prospecting Rights, concentrated initially on anomalies identified by ASVI in the Sheba Hills and Jamestown Schist Belt areas. 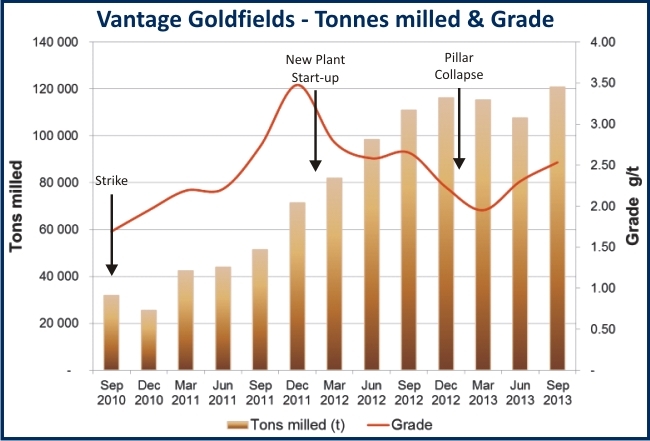 Due to austerity measures introduced by the Company following the decline in gold prices during 2013, field exploration activities were reduced in all of the project areas. 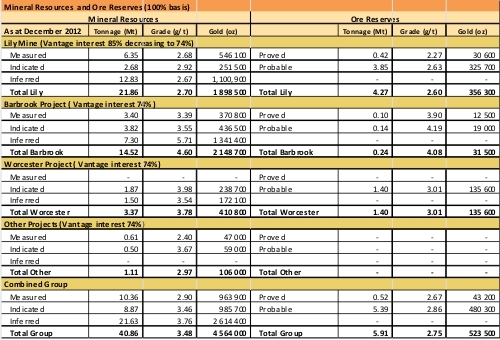 These will, however, be resumed once sufficient funding becomes available to complete the next phases of prospecting in the principal priority areas. The principal Competent Persons responsible for reporting the Mineral Resource and Ore Reserve information are Mr S Mawson, Mineral Resource Management Consultant, who is a member of the South African Council for Natural Scientific Professions (“SACNASP”), Mr M Begg, General Manager, who is a member of the Geological Society of South Africa (“GSSA”) and SACNASP and Dr W Stear, Executive Director, who is a fellow of the AusIMM. The GSSA is a Recognised Overseas Professional Organisation" (“ROPO”). Mr Mawson is responsible for the Mineral Resource modelling. 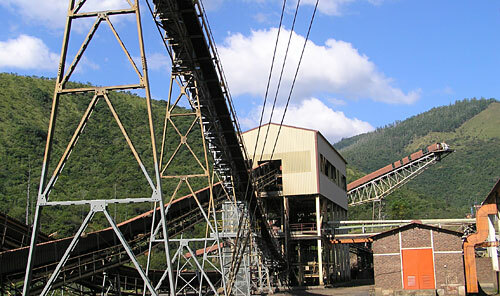 Mr Begg and Dr Stear are responsible for the Mineral Resource reporting. All three persons are full time employees of Vantage. 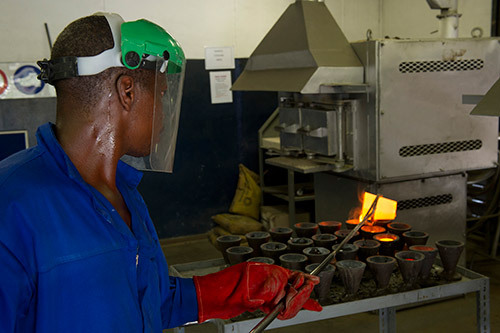 The Competent Person responsible for the Independent Audit of the Mineral Resource is Professor R C A Minnitt, JCI Professor of Mineral Resources and Reserves, School of Mining Engineering, University of Witwatersrand, South Africa. Professor Minnitt is a fellow of the AusIMM. All four persons have sufficient relevant experience to qualify as Competent Persons as defined in the 2004 Edition of the “Australasian Code for Reporting of Exploration Results, Mineral Resources and Ore Reserves”. In July 2010, the Company completed a high resolution magnetic and radiometric aerial survey over portions of Vantage’s mineral rights.